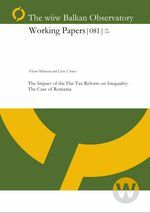 In this paper we focused on the flat tax impact on inequality in Romania. We compared 2005 against 2004, when we were able to isolate the flat tax impact from other factors. We found that the higher the gross wage, the higher the flat tax gains. The inequality indicators we calculated (the Gini index, the relative mean deviation, the coeficient of variation, the standard deviation of logarithms, the Mehran index and the Piesch index) show an increase in inequality determined by the flat tax. The Lorenz curve is illustrative, as only the last quantile of the population (richest 20%) appears as the clear winner of the flat tax. The results also indicate that the income elasticity of consumption is decreasing across quartiles, from 81 to 71 percent. We conclude that the flat tax led to increased income inequality and it stimulated households consumption particularly among the wealthiest households.